Funeral Service Directors are often stereotyped, and not surprisingly, in ways that make it so that people are not usually attracted to the profession. When the Funeral Service Association of BC asked us to develop materials for their apprenticeship and mentoring program, the challenge was to speak to and appeal to both potential mentors and trainees. Using existing research and working closely with the FSABC advisory committee, we developed a series of brochures and and trade show materials for both audiences by relating the words of people who had recently been through the program in both capacities. 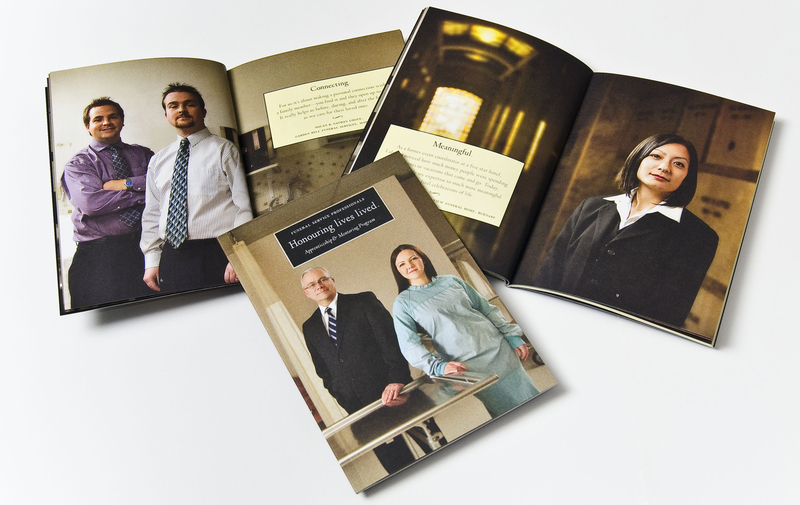 Their words are incredibly powerful, especially when combined with the engaging portraits of the spokespeople, people who definitely do not look like typical funeral directors or embalmers. We’ve also designed it with an eye on the future. It can easily be extended for use nationally, making it highly cost-effective. “We have been made aware… that associations from across Canada and the U.S. have written and phoned… to comment on the excellent booklet that Emdoubleyou produced to encourage individuals to enter the profession and also for encouragement of managers and owners to hire an apprentice.